The primary driver augmenting the global commercial avionics systems market is the growing demand for systems that can calculate real time data for the aviation industry. The overall impact of this demand is expected to be very high over the coming years and is expected to mold the market to its specific way. Another driver for the global commercial avionics systems market is the rate at which the aviation industry is evolving within the developed economies of North America and Europe. They are giving a much larger room for improvements and development to players from the global commercial avionics systems market than other regions. The market is also benefitting from other technological advancements in aviation such as the modern glass cockpit and the use of better in-flight entertainment systems. However, the global commercial avionics systems market is currently being restricted by the reluctance of players to engage in larger activities due to the high costs of system maintenance. The use of modern commercial avionics systems also makes aviation vehicles more susceptible to online hacks. The global commercial avionics systems market is expected to reach US$31.07 bn by the end of 2024, by expanding at a CAGR of 3.5% within a forecast period from 2016 to 2024. At the end of 2016, the global commercial avionics systems market is expected to reach US$25.34 bn. The global commercial avionics systems market is segmented on the basis of the common systems available, into cabin systems, integrated modular avionics, surveillance systems, avionics full duplex switched Ethernet, cockpit systems, navigation systems, flight control and emergency system, communication systems, electrical systems, and central maintenance systems. Of these, navigation systems are expected to lead the global commercial avionics systems market as a key component in terms of both demand and development value. Older ground and air systems tech is being upgraded and this is expected to become the prime driver for the global commercial avionics systems market. Global navigation satellite systems are expected to slowly replace ground support systems and become a positive source of revenue and market influence on the global field. Additionally, an increase in the use of GPS, multi-mode receivers, and flight management systems is expected to propel the demand for refined navigation systems. The growth in the use of glass cockpit is the leading factor driving the cockpit systems segment of the global commercial avionics systems market. These cockpits allow pilots to focus on pertinent data, making operations easier. On the basis of geography, the global commercial avionics systems market is categorized into North America, Europe, Asia Pacific, and the rest of the world. In 2015, North America led the global commercial avionics systems market in terms of revenue generation and demand growth rate, followed by Europe. Both regions attribute a healthy market for commercial avionics systems to the recent rates of improvements in economy as well as a high level of acceptance for modern technology. In 2015, North America accounted for 42.4% of the global market, and is forecasted to maintain its lead till 2024. The introduction of the NextGen Avionics program by the U.S. FAA has also been another factor expected to drive global commercial avionics systems market over the coming years. The leading players in the global commercial avionics systems market till 2015, include Honeywell Aerospace, Thales Group, Rockwell Collins Inc., L-3 Avionics System, United Technologies Corporation, Avidyne Corporation, GE Aviation, Panasonic Avionics Corporation, Garmin Ltd., and Universal Avionics System Corporation. The role of commercial avionics systems is continuously growing in the aviation industry. Avionics systems include all the systems incorporated in the aircraft cockpit, such as navigation, surveillance, control, maintenance, monitoring, display, communication, electrical, guidance, and anti-collision systems. The effective operation of these systems collectively, improves the overall performance of the aircraft. 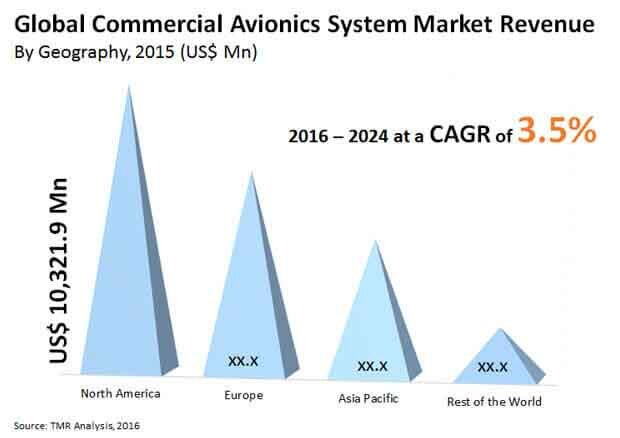 The market for commercial avionics systems is expected to experience a positive shift during the forecast period from 2016 to 2024 due to increasing investments, emergence of new players in the market and adoption of advanced technology to develop more effective avionics systems. The robust growth in the communication systems segment has been a driving factor for the growth in the commercial avionics systems market. Besides, escalating adoption of fixed wing aircrafts significantly pushes the global commercial avionics systems market. Increasing production of commercial avionics systems is backed by the highlighting of commercial efficiency and reduction of cost. Additionally, falling cost of vital components and technological progresshave been supporting the market of late. Rising concerns for preventing cyber attacks, increasing expenses for regular training of aircrew, and high maintenance cost are the major restraints to this market. Based on systems type, the commercial avionics systems market is categorized into integrated modular avionics, avionics full duplex switched ethernet, cockpit systems, cabin systems, flight control and emergency system, surveillance systems, navigation systems, and other systems. In the systems segmentation, the navigation segment recorded as the largest market, followed by flight control and emergency systems, at present. Surveillance follows flight control and emergency system, and is a widely used commercial avionics systems technologies for assimilating manufacturing operations across many layers consisting of maintenance. Communication systems are of paramount importance in rotary wing aircrafts. The cockpit systems are further grouped into control and display systems, head-up display, and on-board airport navigation systems. Cabin systems are classified into cabin electronics systems, and in-flight entertainment (IFE). Flight control and emergency systems are segmented into auto flight control systems, flight guidance control panel, and flight warning system. The navigation system is categorized into air data units, integrated electronic standby instruments, attitude and heading reference systems, inertial reference systems, global positioning systems, flight management systems, radio-navigation, terrain & traffic collision avoidance system, and weather radar. Based onaircraft type, the commercial avionics systems market is segregated into fixed wing aircrafts, and rotary wing aircrafts. Rapidly growing demand for very large fixed wing aircrafts is a major driving factor for the demand of commercial avionics systems end users in the global market. Commercial avionics systems are now subject to consolidation, with giant industrial companies acquiring smaller firms at an astounding speed. Surveillance systems are segmented into radio altimeter and air traffic control. The fixed wing aircrafts segment is further categorized as very large aircraft, wide body aircraft, and narrow body aircraft. Narrow body aircrafts account for the largest market share, while very large aircrafts are expected to grow at the fastest rate. On the basis of geographical regions, the commercial avionics systems market is categorized into North America, Europe, Asia-Pacific (APAC), and Rest of the World. In 2015, North America accounted for the largest market share of the market, followed by Europe, Asia Pacific, and the Rest of the World. Asia Pacific region is expected to growrapidly with rising trade with Europe and North America. Regional companies concentrate on merging with organizations in areas such as the Middle East and Africa. The leading companies in the global commercial avionics systems market are Rockwell Collins Inc., Honeywell Aerospace, Thales Group, United Technologies Corporation, L-3 Avionics System, GE Aviation, Avidyne Corporation, Garmin Ltd., Universal Avionics System Corporation, Panasonic Avionics Corporation.